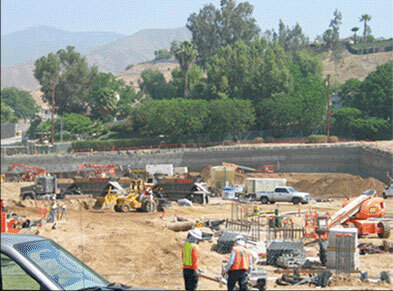 The Phase II Parking Structure at the San Manuel Resort sits within 50 feet of the San Andreas Fault. 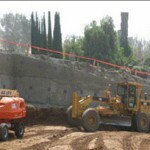 The San Manuel Band of Mission Indians hired PB&A to design an Earth Retention System that would protect the parking structure from catastrophic damage should a seismic event occur along the fault. Our engineers performed a Dynamic Finite Element Analysis using the state-of-the-art “Plaxis” program (Dynamic Module) to determine the maximum deformation of the wall in case of a credible seismic event. Our engineers worked closely with Kleinfelder, Geotechnical Engineers for the Project, to obtain the necessary site specific acceleration histogram. 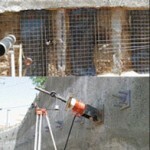 One challenge of the project was in parts where the wall was being constructed in loose to medium sand, localized surface instability was an issue. 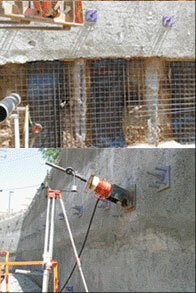 PB&A devised an innovative technique of using ‘V-nails” in conjunction with the soil nails that not only mitigates localized surface instability during construction, but also greatly enhances the overall performance of the wall under seismic and static loading.